Temperatures are sub-zero this morning. MOTORISTS ARE BEING warned to take care on the roads as three separate status yellow snow-ice warnings have been issued across the country. Met Éireann said that a night of widespread severe frost has lead to icy conditions on untreated surfaces. A status yellow snow-ice warning is currently in place for Cavan, Monaghan, Donegal, Dublin, Carlow, Kildare, Kilkenny, Laois, Louth, Wicklow, Offaly, Westmeath, Meath, Leitrim, Cork, Limerick and Tipperary. This is valid between 4pm today and 9am tomorrow morning. Met Éireann is warning of “snow accumulations of less than 2cm this evening and tonight”. Patches of freezing fog and snow showers are also expected across the country throughout the day, along with sub-zero temperatures. Earlier today, a status yellow snow-ice warning was issued for Galway, Clare, Cork, Kerry, Limerick and Tipperary. This will remain in place until 2pm today. The third warning was issued for Leinster, Cavan, Monaghan and Donegal. This warning is valid between 3pm this afternoon and 3am. A severe frost and icy conditions for many areas this morning. Patches of freezing fog and isolated snow showers also. A band of cloud with patchy rain, sleet and snow will extend from the west and southwest during the day. 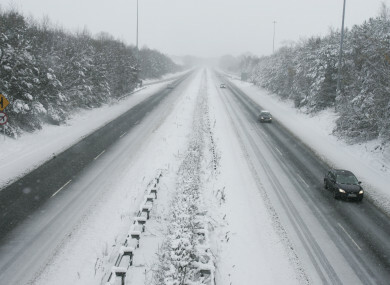 The Road Safety Authority is advising drivers and other road users to be especially vigilant over the next few days, and to keep an eye out for black ice on the roads. Select a low gear when travelling downhill, especially if you’re going around bends. Met Éireann says frost and icy patches will persist tonight with scattered snow showers. Heavy rain will move in from the Atlantic and will spread across the country overnight, turning to sleet and snow at times. The frosty weather will clear overnight and temperatures will rise by tomorrow morning to reach 3 to 5 degrees. Unlike today, tomorrow is forecast to be a bright, fresh day with sunny spells and scattered rain or hail showers. Temperatures will range between 5 to 9 degrees with westerly winds. However, Met Éireann warns that heavy rain will develop later in the southwest. The heavy rain will spread from the southwest and turn to snow as it moves northwards. Snow is expected on Saturday morning over Ulster, however, it will clear away in the afternoon and make way for mainly dry weather. Temperatures will range from 7 degrees in the north to 12 or 13 degrees in the southwest. Sunday is forecast to be a cool, blustery day with sunny spells. Email “Three status yellow snow-ice warnings issued as sub-zero temperatures hit the country”. Feedback on “Three status yellow snow-ice warnings issued as sub-zero temperatures hit the country”.